Harvest season has started a couple of weeks early for South Jersey’s grape growers, which means winemakers are hoping for very little rain between now and October. The less water grapevines soak up, the more concentrated the grapes’ sugars will be, and the more intense the wines made from that fruit. Rain only dilutes the flavor. “I get up every morning and do an anti-rain dance,” said Art Reale, the co-owner of the Jessie Creek Winery in Middle Township. A relatively dry July and average August rainfall has led to optimistic predictions for the 2012 vintage. New Jersey vintners are hoping a good year will not only sell bottles, but nurture their growing notoriety in the wine world. Last year did not go the way local vintners would have liked; Tropical Storm Irene helped dump more than 11 inches of rain in August 2011, compared with an average of about 4 inches that month during the past 20 years, National Weather Service data show. That created problems with fungal growth and less flavorful fruit, said Gary Pavlis, a wine expert at Rutgers University. 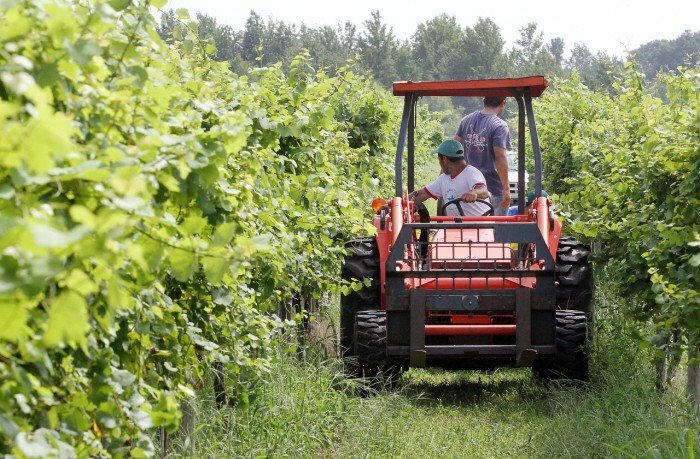 South Jersey was somewhat spoiled in 2010, which winemakers here generally consider the best year ever for grape growing in the Garden State: A combined 6 inches of rain fell from June through August, making 2010 the fifth-driest period for those three months in a century. By comparison, 6 inches of rain fell this past June, nearly 3½ inches fell in July and slightly more than 4 inches have fallen so far in August. That may be enough. Before 2010, the region hadn’t had a season that dry since 1964. At that time, there were only a few wineries in the state, such as Tomasello Winery in Hammonton and Renault Winery in Egg Harbor City. Today, there are more than 60 wineries in New Jersey, and the number is growing. Jessie Creek opened earlier this year, Southwind Vineyard and Winery in Deerfield Township opened in early August and the Willow Creek Winery in West Cape May is expected to open this weekend. White wines produced from grapes grown in 2010 were available the following spring, but red wines, which take longer to produce, are just now being sold. And they have gained a following. In June, New Jersey wines went head to head with several renowned French wines during a blind taste test at the American Association of Wine Economists conference in Princeton. The test has become known as “The Judgment of Princeton,” a play off of “The Judgment of Paris” in which French judges chose Napa Valley wines over their own in a blind taste test — sealing California wines’ legitimacy. While “The Judgment of Princeton” was less declarative, it did make a statement. Expensive French wines took the top spots among both reds and whites, but two 2010 chardonnays from New Jersey placed second and third in the white category and a 2010 blend from Heritage Vineyards in Mullica Hill, Gloucester County, ranked third in the red category. The rankings were separated by only a few votes in each case, which led the organizers to state there was hardly any difference between them. But the price tags on those bottles would lead you to believe otherwise: Heritage Estate Reserve BDX, for example, costs $70 a bottle, and it ranked third behind two French wines that each sell for $650 a bottle. The news was picked up by the national media, and it has brought professional wine critics to New Jersey to try the wines for themselves. Winemakers are cautious in saying that this year nearly matches the quality they saw two years ago. The quantity of grapes may be down this year as well. An early bloom and late frost led to some farmers losing flower buds that would have turned into grapes. Those effects have been felt differently throughout the region because of how weather conditions subtly fluctuate, creating so-called microclimates. Cape May County, for instance, was spared the worst of the frost because the winds traveling over the peninsula between the Delaware Bay and Atlantic Ocean kept the vines from freezing. Todd Wuerker, owner of Hawk Haven Vineyards in Lower Township, said he had no damage from that frost. Wuerker has nine acres of vines at his farm on Railroad Avenue, but he also manages and buys grapes from another 35-acre farm, Atlantic Garden Vineyard, about half a mile away. He said so far the sugar concentrations in his grapes have been near optimum. Just as encouraging has been his ability to open two new retail outlets in the county after a law passed earlier this year loosened regulations on where and how winemakers can sell their products. Wuerker now sells bottles inside the Cape May Fish Market in Cape May and Quahog’s Seafood Shack in Stone Harbor, and he said that has been a big boost for his business. “It’s been really, really good at the two new outlets,” he said. In Deerfield Township, Lorre Allen, co-owner of Southwind Vineyard and Winery, said she will likely have to purchase some California grapes to make wine this year because of a shortfall in the vineyards near her in Cumberland County. They plan to start harvesting next week, depending on the weather. There are more than three acres of vines there now on Lebanon Road, but they plan to keep adding a few more acres every year.